As expected, Gov. 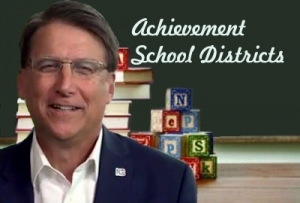 Pat McCrory has signed House Bill 1080, controversial legislation that will allow for-profit charter takeovers of several low-performing schools in North Carolina. McCrory’s office announced the signing Tuesday, although the news was buried in a press release about the governor’s signing of legislation intended to help state officials keep track of veterans. It’s unclear when the governor gave his seal to the bill. On Tuesday, staff at McCrory’s press office did not respond to Policy Watch’s inquiries about the signing. The bill, which was opposed by most Democrats and public school backers in the state legislature, creates a statewide “achievement school district” for five low-performing schools. Lt. Gov. Dan Forest, a Republican school-choice supporter who also sits on the State Board of Education, will chair and appoint an advisory committee to choose a superintendent for the special district. That superintendent would tap the schools by Nov. 15, and the State Board of Education is expected to approve those choices by Jan. 15. Given the short time frame, members of the State Board of Education said in a conference call earlier this month that they intended to move quickly implementing the achievement school district. Supporters, including a right-wing, ALEC-affiliated group out of Oklahoma that purchased a full-page ad in a June News & Observer, described the measure as an “innovative” approach to reforming chronically low-performing schools, but critics points out similar reform efforts have produced mixed results in other states such as Tennessee. We’ll stay tuned as state leaders roll out the achievement school district.